Lynn Wilbur “LW” St. John was enshrined in the Naismith Memorial Hall of Fame in 1962 for his contributions to basketball. Although he was active in athletics in high school and college, his strong contributions to the game were in administration and with activities on the NCAA and International rules committees. His contributions were during a time of tremendous growth and was known as a “master of diplomacy”. St. John was a graduate of Monroe High School where he played football, basketball, baseball and track. He attended college at The Ohio State University, The College of Wooster and Starling (Ohio) Medical College. St. John played halfback for OSU in 1900. He coached at the College of Wooster (1902-09), Ohio Wesleyan (1902-11) and OSU (1912-19). LW St. John served on the Olympic basketball committee and served as chairman of the NCAA rules committee from 1912 to 1937, along with James Naismith. The basketball arena at Ohio State University, where he coached (1912-19) and became Athletic Director in 1915, was named in his honor after its construction in 1956. 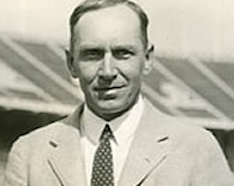 St. John served at OSU’s Athletic Director for 33 years, ending his tenure in 1947. He died on September 30, 1950.